Today was all about recovering and playing catch up and trying to focus my ADHD brain into finishing these damn reports that are all overdue, and failing at mostly everything except the recovery part. I did a great job of not getting any fresh air, and looking wistfully outdoors a lot, and also managing to wear my comfortable pants all day long. That’s certainly an achievement to be pleased about, if everything else was subpar. 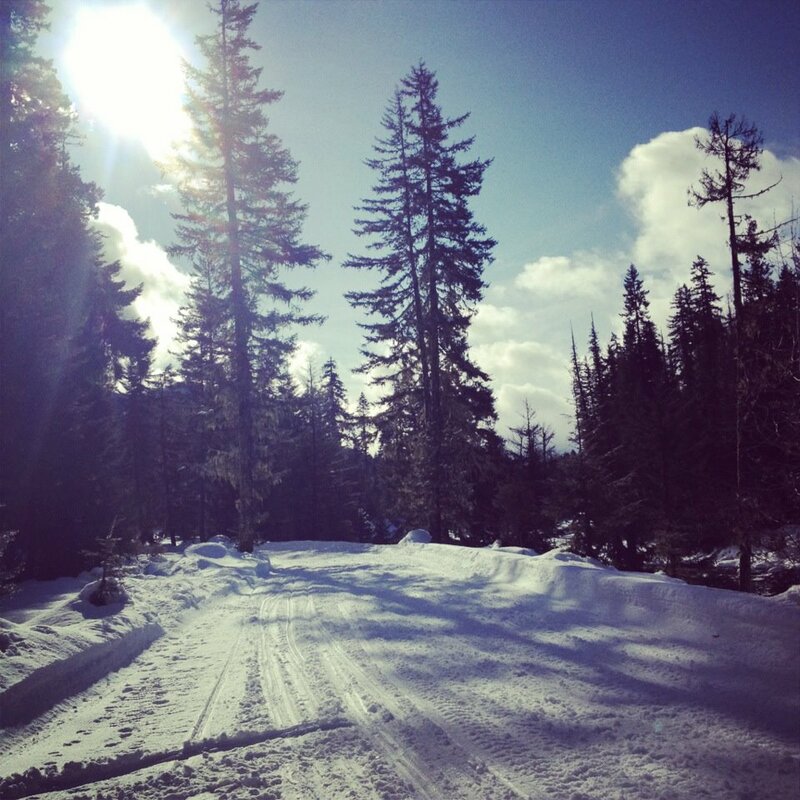 The recovery was from a winter wonderland adventure that made me this much more OK with living here in the Northwest again, as if I wasn’t sure yet that it’s great and needed extra confirmation. 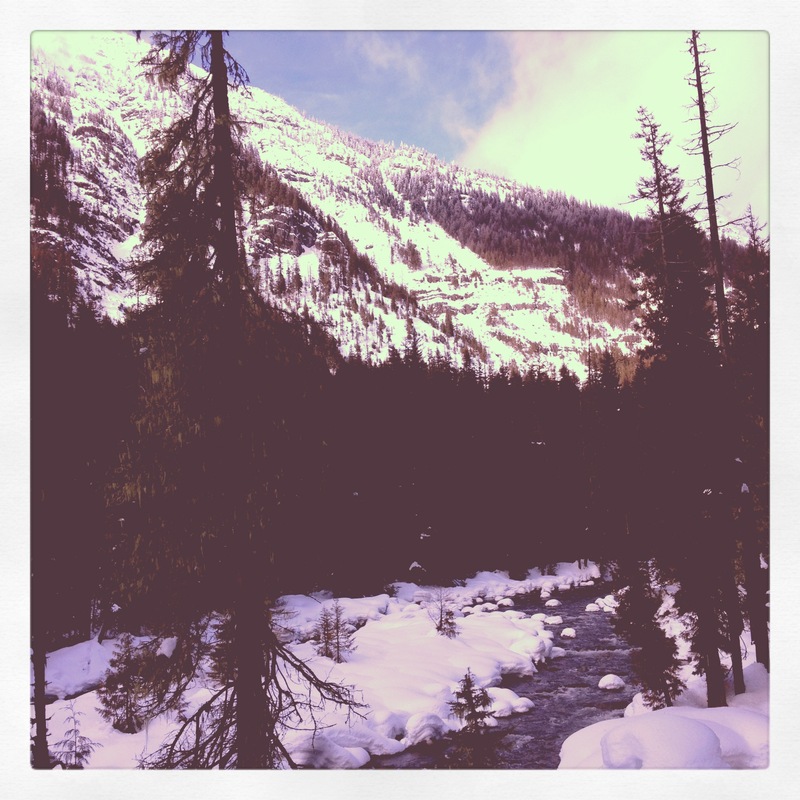 Short story, I got to snowshoe hike to a yurt, and sleep in said yurt next to a roaring river and a glowing fire. Do you really even need the long version? I mean it doesn’t need explanation beyond that, but I’ll tell it anyways. Robby works with Coral, who owns a yurt with her mother, Pam. Pam was worried that all the heavy snow we’ve had lately might have collapsed the yurt, being that its 12 years old and such. Jeff and Robby brought this up at some point while we were all a few pints in at the pub last week, and mentioned that Pam had asked them if they wanted to go dig it out for her soon. I nearly lept off my bar stool. Two-pints McGee, exclaiming oh my god we have to do it, let’s go! can we really? oh man, you guys! Plans were made. We swore oaths to not back out on Monday, and I resolved that more of my hard earned cash needed to be spent on an Arcteryx jacket. After all, if I was going to survive or die in the wilderness, either way I wanted to come out wearing Gore-tex with waterproof zippers. Sunday night, I rented my snowshoes from the quirky older guy in the gear garage at REI. Promised to bring them back clean and dry. Feverishly tried to finish up some work and pack before realizing it was past midnight and my hope of a good night’s sleep was a lost cause. Monday, I drive through morning rush hour traffic up to Greenlake to meet Robby, thank god first for coffee at the shop down the block from their house. I like this joint. I find Robby at the same table as last time, reading the newspaper. I learn that Jeff is not coming. He has to do his taxes or something.. this from the same guy that looked me in the eye on Thursday and told me not to flake out. We suspect his girlfriend might have been the reason. No matter, we have an adventure to get to! We stop back at the house to make sure Jeff doesn’t want to change his mind, and so I can give him grief, and then we head out. First stop is the grocery store. We buy cheese, summer sausage, fruit, oatmeal. Jeff was supposed to be the chef on this trip, so with the change in plans, Robby and I resort to what can be consumed raw and made edible in a Jetboil. I had also packed homemade oatmeal-blueberry cookies and some Seagrams gin. Essentials. To the road we go. Over the pass, we drive toward Cle Elum and turn north where the old twin mining towns of Roslyn and Ronald sit as half-hearted gatekeepers to the Cle Elum River, Salmon le Sac and this particular route into the Alpine Lakes Wilderness. Roslyn is cheery and cute in its small town old-timeyness, Ronald is the slouching curmudgeon next door. We roll through both, eyeing The Brick, the longest operating bar in Washington’s history where we’ll get victory beers the next day on our way back. Then, the road for cars ends, and we park. Shoe up, haul on our oversized one-night packs, and start trudging. It’s beautiful out. I’m sweating and silently cursing myself for not packing properly, but the view is so serene and the exertion feels good. We talk intermittently, other times we move together in silence up the hilly road. Somewhere around the fourth mile, my boots are waterlogged and my feet completely frozen. I start to think about WFR class and am convinced I’m getting Trench Foot. I try to think about other things. We must be close, I tell myself. Then, thankfully, we reach the turn off, marked by two silver diamonds nailed to a tree and the tracks of Pam and her friend who’d come up a day or two prior to get started on the shoveling. Robby descended into green and white and I followed. Everything was quiet. I wanted a fire and the ice blocks removed from my feet as immediately as possible, but the moss covered cedars with their wizard beards soon made me hush. We approached the yurt, and I saw the river, and I felt really really lucky. I met Pam. It’s safe to say I’d aspire to be like her when I’m a middle aged woman. And not just because she owns a yurt and treehouse next to a river, but a lot because of that. She and her companion passed the torch to us, handing over red snow shovels and giving instructions for how to close up when we left. Then they snapped a photo and hiked back up to the road, disappearing into the trees. After a tour of the property, including a treehouse jutting out over the river that could be in Architectural Digest, we had a snack, pulled our freezing wet boots back on and got to work. We shoveled snow for 3 hours, continuing to clear a perimeter around the base on the yurt where Pam and Co had left off. After the hike in, I wasn’t sure I had the energy. But once we started, it felt good. And warmed me up. We finished just in time to settle in before dark and build a fire. Then, we sat by it and drank gin and talked and didn’t talk. After a while, the idea of a night hike came up. I don’t remember who suggested it, but it sounded good. Our boots and socks were mostly dry, so we put them back on and clipped on headlamps and walked up to the road. The half-moon lit up the snow, and we didn’t need our lights. Everything else in sight did not exist, except as a silhouette. I shivered, grinning with the familiar awed excitement that spills out of my eyes and mouth and limbs when I get to do things that I think most adults don’t. Like going for moonlit snowshoe hikes in the forest while half-drunk and the stars are out and the mountain in front of you looks like an Ansel Adams photograph and you can’t believe you get to be alive on this earth. The spell of being holed up in the woods with nothing but the trees to sway in between you and the Milky Way. Yeah, that. I thought we’d go out for 20 minutes and then go back to the fire. We ended up walking nearly 2.5 hours before making it back to the yurt. It was just too good to not stop walking. Retiring finally for the night, we crawled into our sleeping bags next to a slowly dying fire, and chatted sleepily until the words ran out from exhaustion. That didn’t take long. I went to sleep gazing up through the skylight overhead, portal to the heavens. I awoke at 9 and wandered around solo for a while in the morning. Did some sun salutes up in the treehouse as the light spread across the river from where it rose behind the mountains. Robby woke up a bit later, and after coffee, we slowly packed up and cleaned. After one last hike around the property, enjoying the remaining sun while the clouds rolled in steadily from across the valley, we threw our packs back on and snowshoed the five miles back out to the car. Stopping as promised at The Brick, we ordered IPAs and burgers and sat on the metal stools in our down jackets and hats, amused by the antics of Roslyn’s local characters while cloudy water flowed in the trough spittoon below our feet. So, what have we learned? That yurts in the forest are magical. And not as expensive as houses. Privy’s can be luxurious, and have the best view you’ve ever known from a toilet seat. Cheese and meat and crackers make as fine a dinner as any, when you’ve labored all day and can’t be bothered to boil rice. Bottom shelf gin also tastes pretty damn good at this point. Adventure buddies are invaluable, and should be kept on speed-dial at all times. Post-adventure beers and hamburgers are always the best meal you’ve ever had in your life. And nothing cleanses away the dirt like a walk in the woods. LOVE LOVE LOVE THIS!!! More of this please!